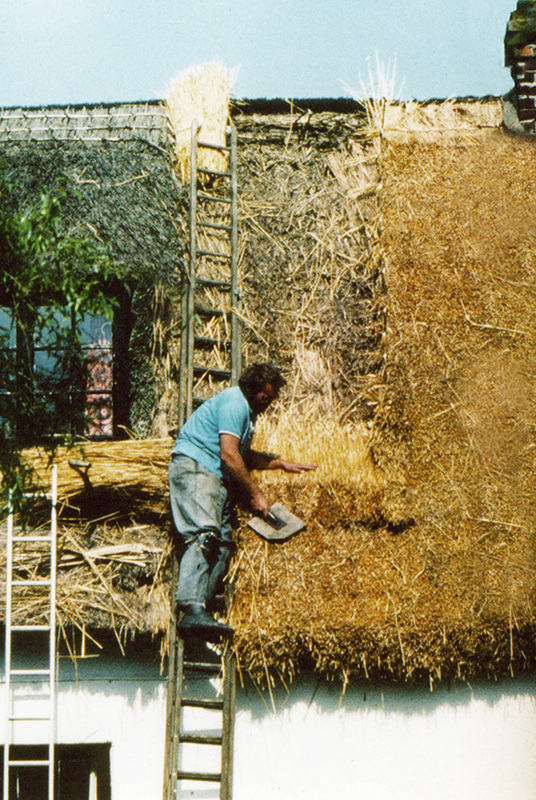 Abeginners guide to the craft of thatching; which answers two questions; how long does thatch last and how much will it cost… These are the questions every thatcher is asked most frequently. 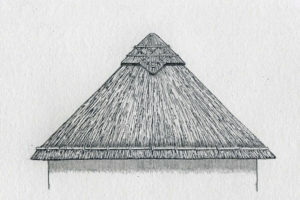 And they are the most difficult ones to answer, as nearly every thatch roof is a unique combination, of the size, shape and location of the roof and the materials and thatching skills used to create it. 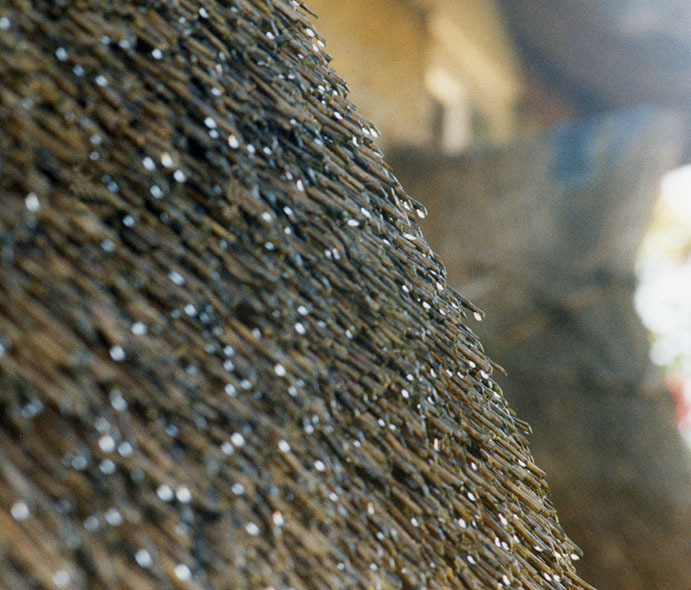 All contribute to the roof’s longevity and the cost of creating the thatch. It might be useful to start with answering a question that is rarely asked. 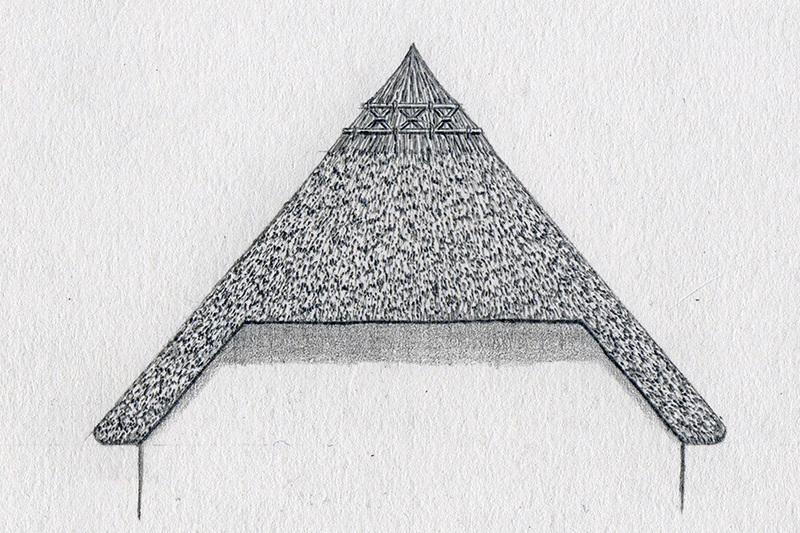 What are the mechanics of a thatched roof? How does a roof, consisting of material that is not waterproof in itself, keep the rain at bay. The answer lies in the physical properties of water, in the form of rain. Fortunately, when rain strikes a roof it does not strictly follow the laws of gravity and will happily run across a surface, as long as it’s in a downwards direction. The surface itself does not have to be waterproof, as long as it is steep enough to speedily shed the water before it can penetrate that surface. With a thatched roof the water is also constantly forming drops, by dripping from one piece of thatch to the next; this effectively keeps the water in small amounts, as it flows over the roof. 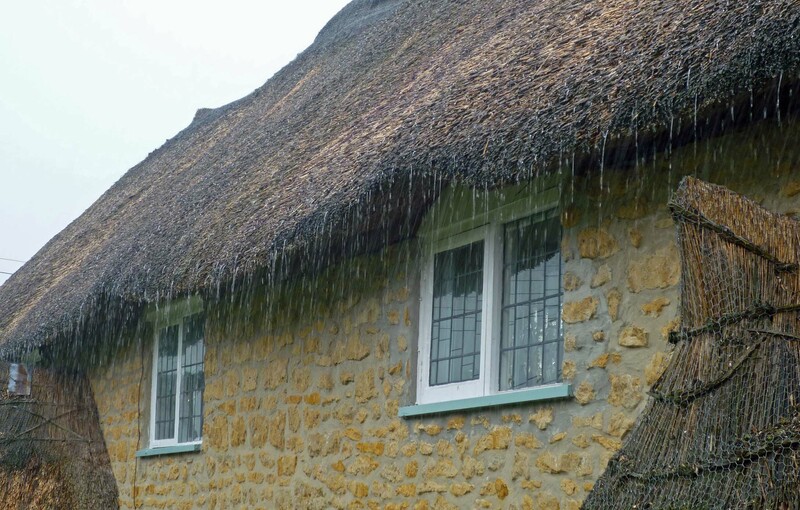 As long as both thatch and roof structures are at the correct angle water will not penetrate more than an inch (25mm) or so. So the working surface of a thatched roof is actually quite thin. Experience has shown that a roof structure, with a minimum pitch of 45 degrees, is necessary for a successful thatched roof. 50 to 55 degrees of pitch is more desirable. A steeply pitched roof is of the utmost importance. 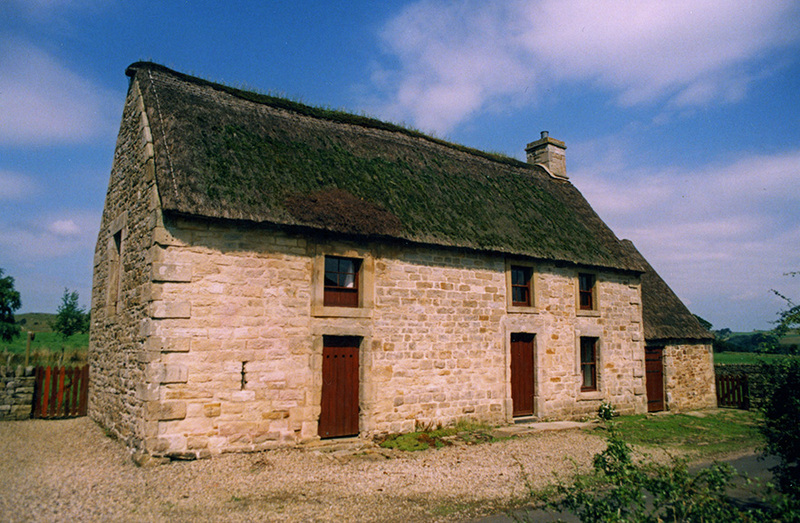 Many roofs have areas near or below this minimum pitch; the thatch above windows or in a valley is often thus; this is normally acceptable; but these portions of the roof will decay the fastest. Three ends… From left to right. A full hipped end at 45 degrees. A half hipped end at 50 degrees. And a full gabled end at 55 degrees. It is noticeable how much longer the roofs get, as the roof pitch increases. Water is shed more efficiently; but at the cost of a bigger roof to thatch and pay for. Ten degrees of extra pitch, creates around twenty per cent more roof. Shedding Rain…. This 50 degree roof is still very waterproof, after 15 years or so. Its large overhanging eaves, found on most thatch, throw the water well away from the property. Porches often protect doorways. 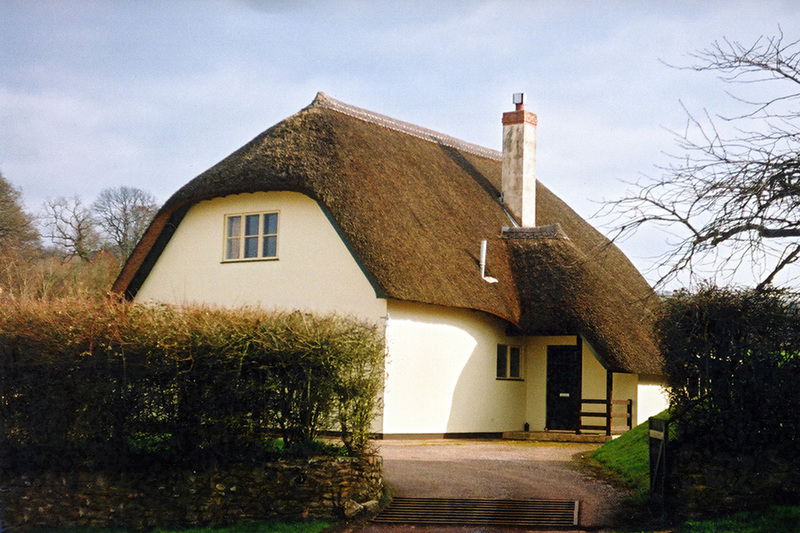 The vast majority of thatching in Britain is carried out using one of three materials. In no particular order they are… Water Reed (Often called Norfolk Reed.) which, as its name implies is harvested in wetland areas. Long Straw, which is thrashed cereal straw, usually of wheat. And Combed Wheat Reed, which is unthrashed cereal straw; applied in a similar way to water reed. Along with these three there is also a little use of heather, marram grass and rushes; mainly in the north of Britain. Being organic products, all thatching materials will eventually decay in an outside environment. LONG STRAW… on the right at Old Basing, Hampshire and at Exton in Rutland. 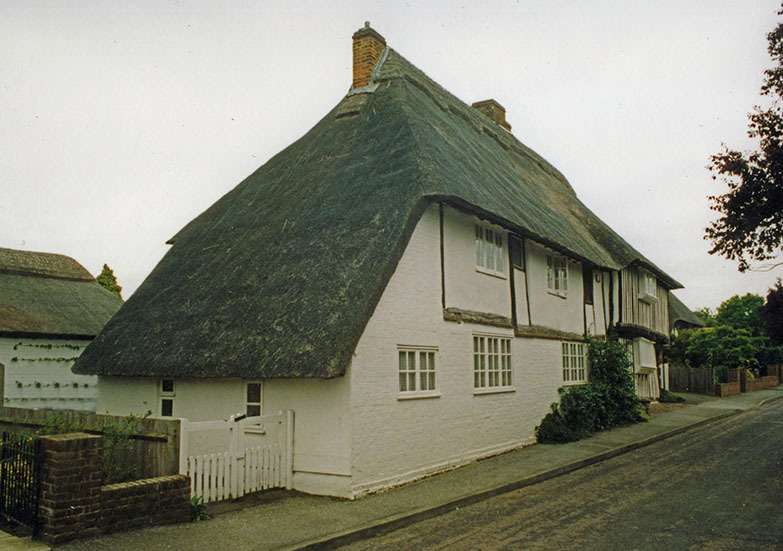 Both splendid examples of plain,long straw thatching; showing the distinctive sparred edges found with this material. COMBED WHEAT REED… on the left at Milborne Port in Somerset and above at Broadhembury, in Devon. The latter thatch used on a new building. Both roofs showing the traditional plain work found hereabouts. The South West of England being the historic home for this material. WATER REED… on the left, the sharp clean lines of East Anglian work, at Kersey in Suffolk, complete with some decoratively shaped coatwork. Topped with a typical local ridge. 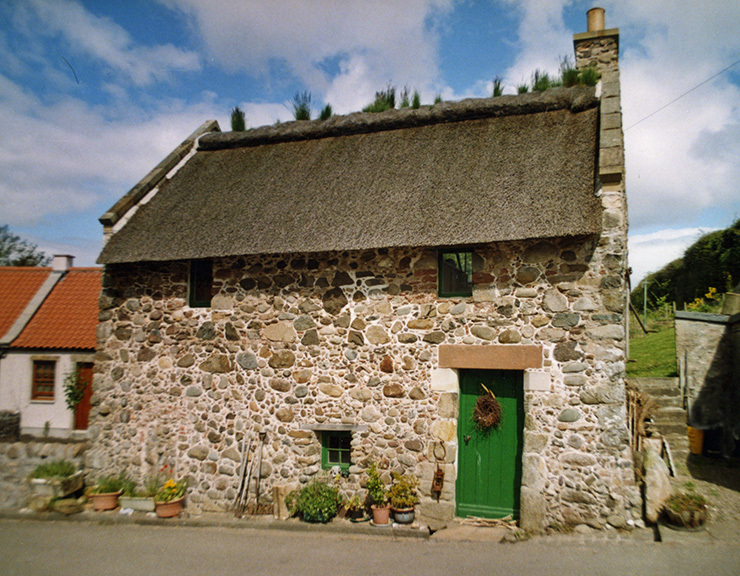 The right hand thatch is much plainer, being found at Collessie, a Fife village with more than a few thatches; coated mainly with Water reeds from the River Tay. The roof shown being ridged with turf. HEATHER... on the left, a neat roof, with a turf ridge, at Bardon Mill in Northumberland. Lying close to Hadrians Wall. The right hand home, on the Hebridean island of South Uist, is coated with MARRAM GRASS. Held in place with weighted wire netting. 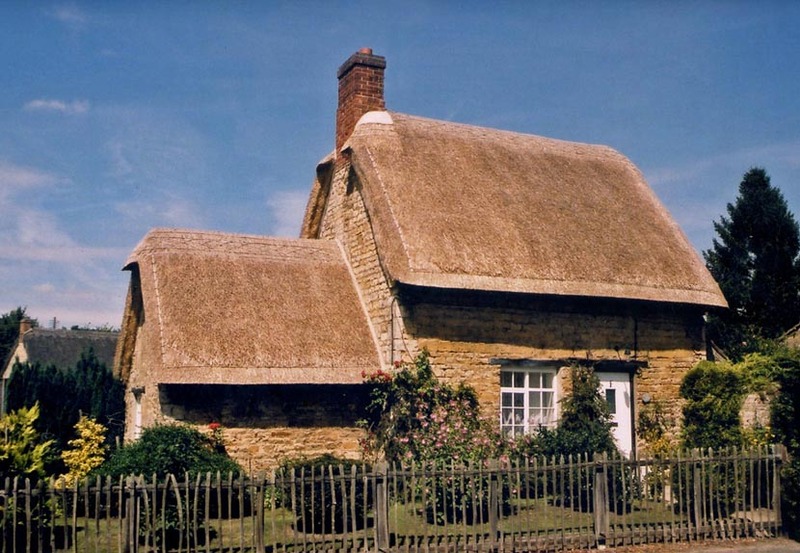 A roof covered, using the Standard method of thatching consists of layers of thatch, commonly known as Courses; which are held in place by Fixings. 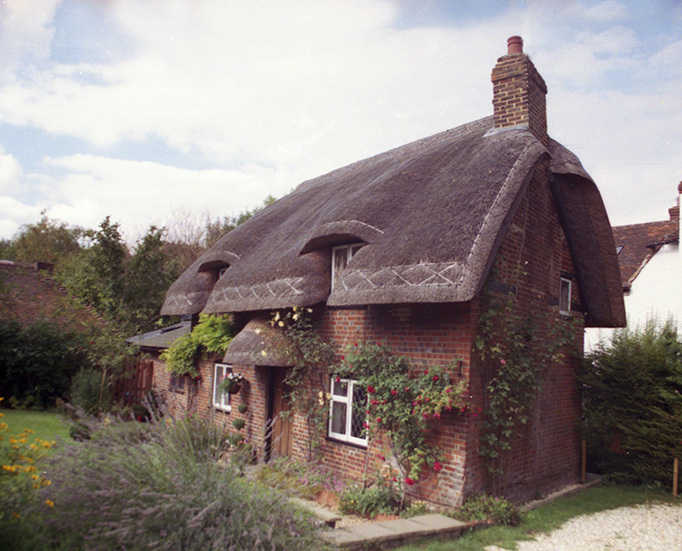 The type of fixing used depends on what the thatch is being attached to. 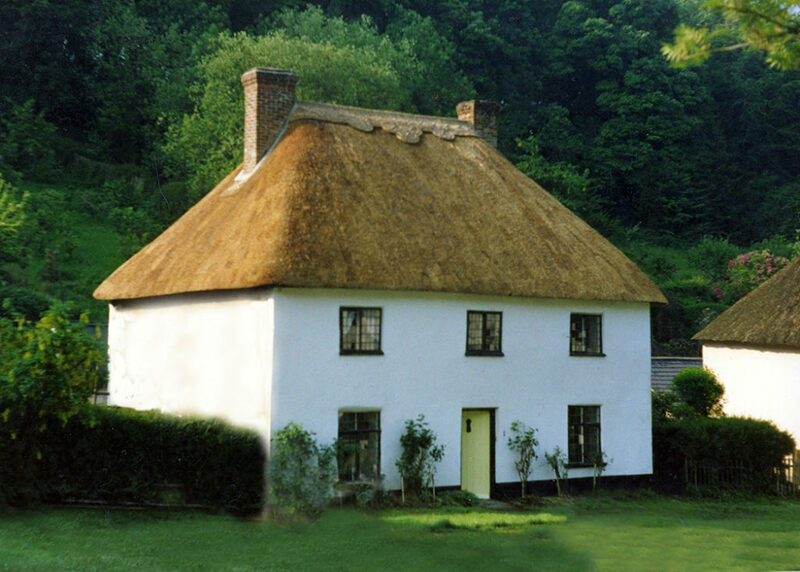 When thatch is being attached directly to the roof timbers; a Single Layered roof is created. Here the material is held in place by a Sway; a long piece of split wood, or more likely steel bar. 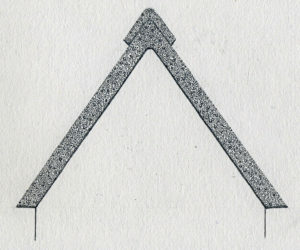 Often a hooked steel spike or Thatching Crook is then used to fix down this sway; a crook being driven into each rafter, along the length of a course of thatch. Alternatively a wire is screwed into the rafter and then tied around the sway. 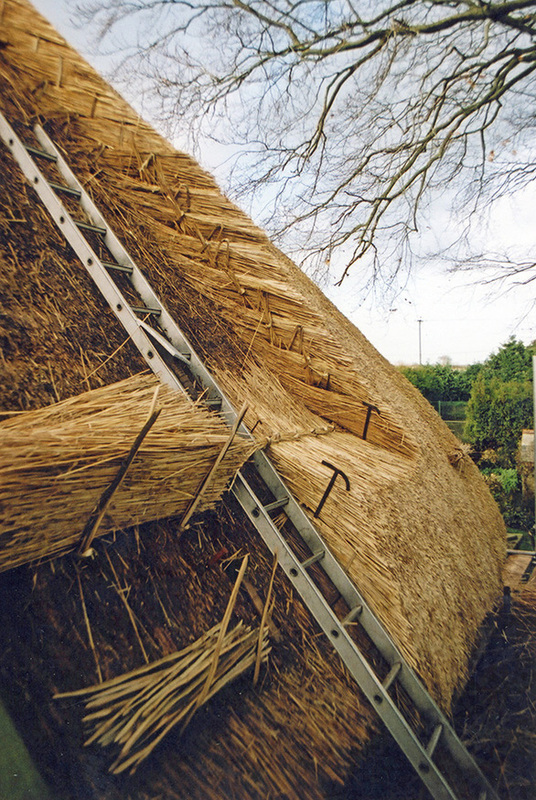 Standard Thatching… Driving a course of combed wheat reed into position, on a multilayered roof. b) Enable the fixing to be put back as far as possible, from the outside of the thatch, thus giving the roof its maximum life. With the correct amount of thatch in place, the material can be fixed, between 15 and 20 inches (370/500mm) up from bottom of the thatch. Without the lower part of the thatch becoming too slack. 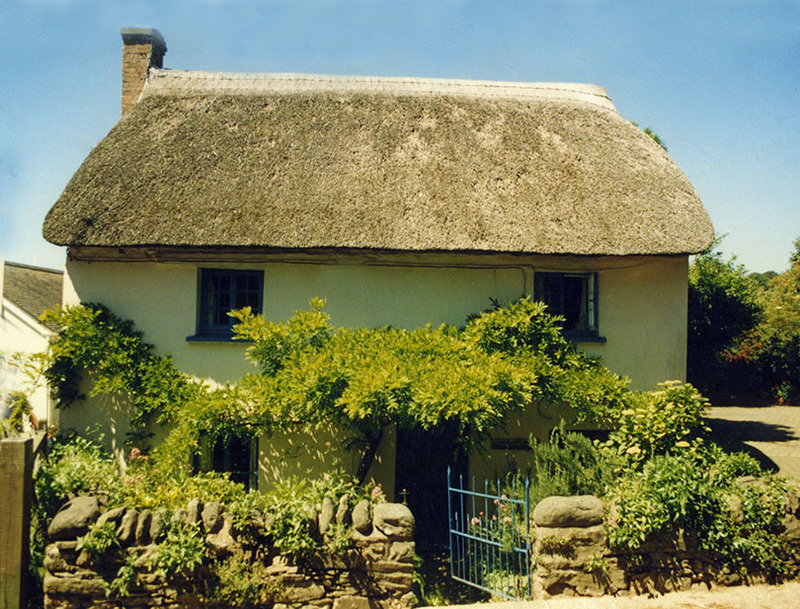 Close up… How courses of standard thatch should lie in a roof; for maximum longevity. If the thatch is being laid properly and is following the pitch of the roof; there should always be a constant Depth of Fixing of around 6 to 8 inches (150/200mm) of coatwork above the fixing. 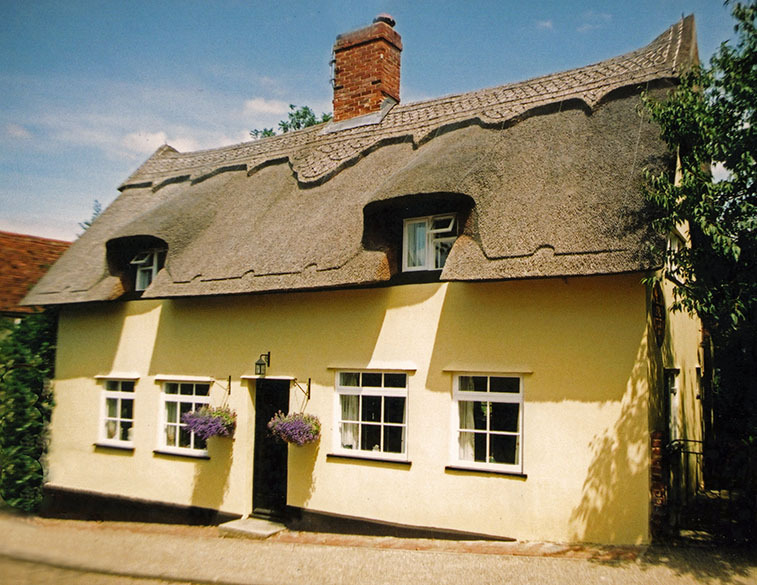 The amount of thatch below the fixing can vary, this being determined by the length of material and any backfilling, giving an overall thickness of anything between 9 and 15 inches (225/375mm) to a thatch roof. A perfectly good coat of combed wheat reed could have the lower measurement; a roof of long water reed the upper; with each having the correct depth of fixing in place. This depth of fixing is a vital measurement. Thatchers often check it; by using the distance across their hand with the thumb extended. This is the working part of the thatch that will wear away over time. The temptation is create more of it. But creating a roof too thick is as bad as having one too thin. If the courses of material are too thin, the fixing has to be brought forwards, towards the outside of the coatwork; to create a firm roof, thus shortening its life. Too thick, and the courses of thatching material will lie too flat; and allow water to run back up the thatch, instead of running off it. A two year old roof I once surveyed, had water penetrating a good nine inches (225mm) up the stems of the thatch; already half way to the fixing, simply because the coatwork was too thick. 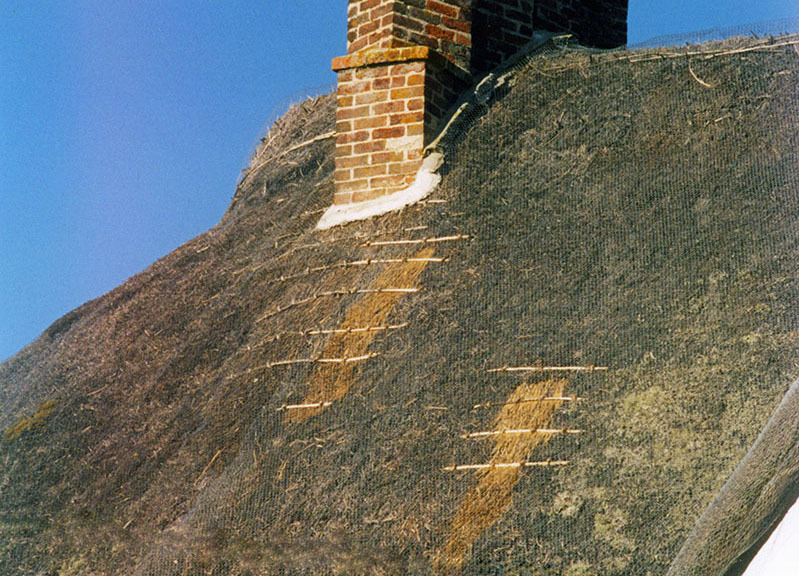 An example of how a thatcher’s skill; or lack of it, can determine a roof’s longevity. With repairs, to Standard thatch roofs and in much thatching in the Highlands and Islands of Scotland and The Isle of Man etc. ; the layers of thatch are often thinner. With the fixings, either on the outside of the roof; or the thatch being tied or weighted down. This is often collectively called, Directional Thatching. These methods are much quicker than the standard one. A roof takes days instead of weeks to complete. 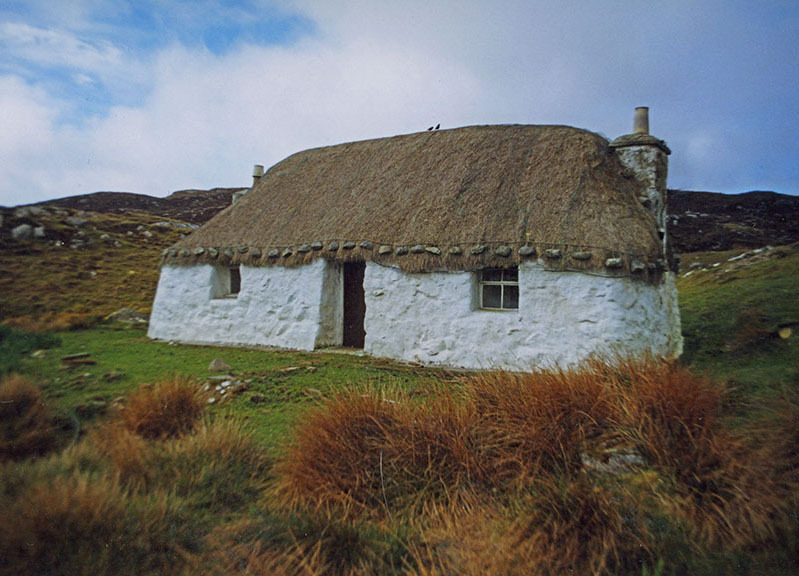 But the thatch only has a short lifespan, a few years instead of several decades. However, over a long period the two methods work out as having a similar cost, in both time and materials. Directional thatching… A whole roof, held in place, by weighted wire netting, on the Isle of South Uist. And a small repair to a Standard thatch; held down by thatching spars. Taking years off… Almost under the spreading branches, in North Devon. And the ever growing churchyard yews, at All Saints, Horsey in Norfolk. These poor conditions affect all materials. 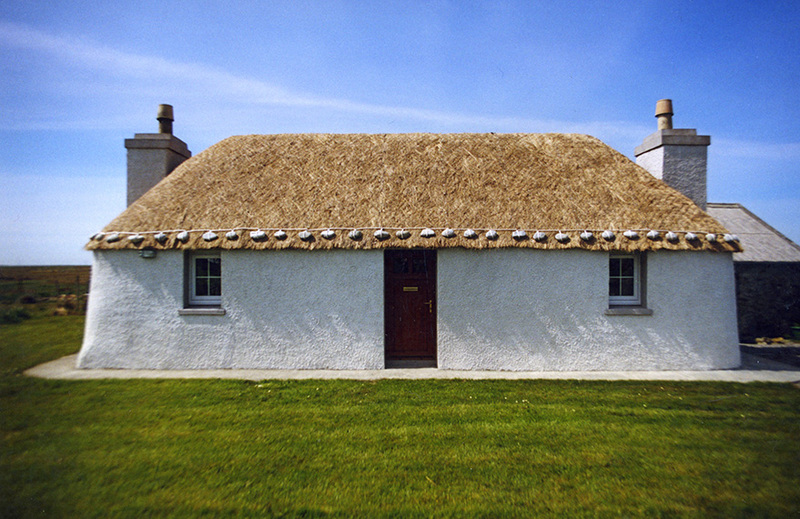 One type of thatch is not necessarily superior to the others. Long straw, gives a more open coatwork, letting the air circulate. Water reed can be finer than combed wheat reed, and last less time. But it does appear that Britain’s longest lasting thatches have been created with water reed and lie in the counties of East Anglia. Sixty year old roofs are common here. Even older ones were noted over two hundred years ago. A Mr Marshall stated that reed thatches would last half a century without attention. And the best part of another fifty years, with some careful repairing. But parts of this area have less rainfall than Jerusalem; a clue to the reason for the longevity of most thatch here. So it seems that sixty year roofs of Water Reed are common on the eastern side of Britain; thatchers on the western side would probably be happy with anything over half that time. Straw roofs and ridges follow the same pattern; forty years becomes twenty or so, with ridges lasting up to ten years in the west, surviving twice as long in the drier east. No overhanging trees… But the sheer length of these roofs can be a problem. These single storey extensions have created ‘Catslide’ roofs. 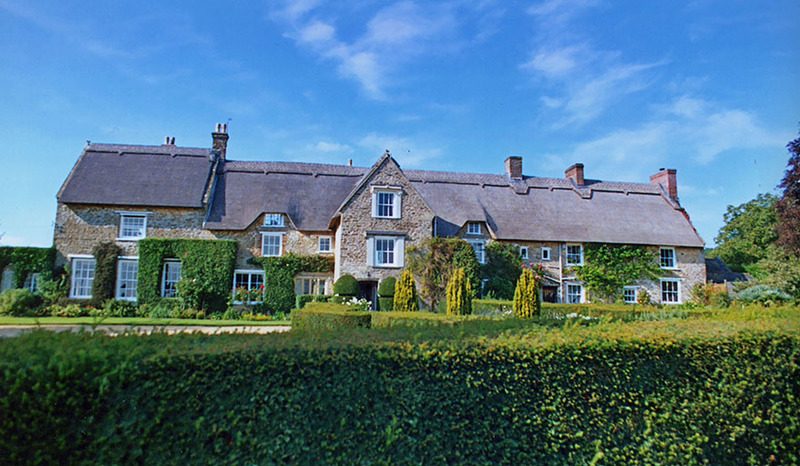 A rear one at Branscombe in Devon and an end extension, at Lynstead in Kent. In the past this was an easy way to extend the living area; without recourse to major roof timbering. But has basically doubled both the roof length and the amount of rain running over the bottom of the thatch. 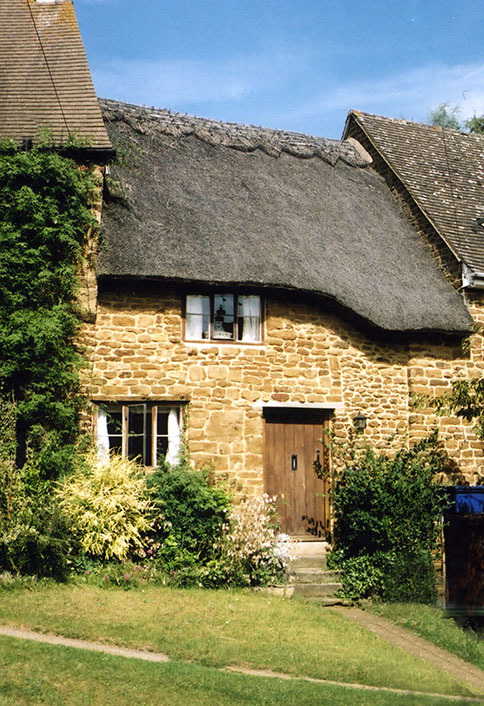 It stands to reason that the main factor in the cost of thatching a roof is its size. The thatcher estimates the roof area in Squares of 100 square feet, or square metres. They will already have a cost, for each material of ££s per square. The top ridging is costed by ££s per foot or metre of length; depending on what type of ridge is required. How many Squares? 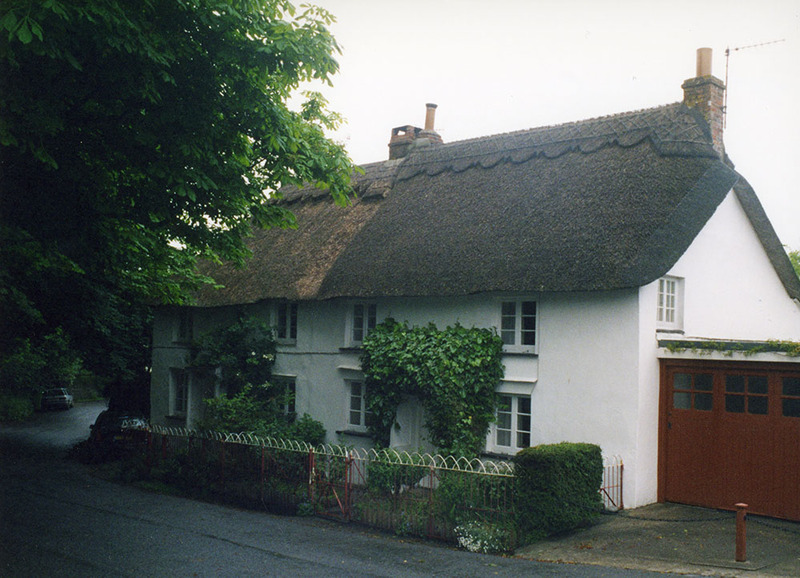 This block of two cottages is part of the well known thatched village of Milton Abbas, in Dorset. 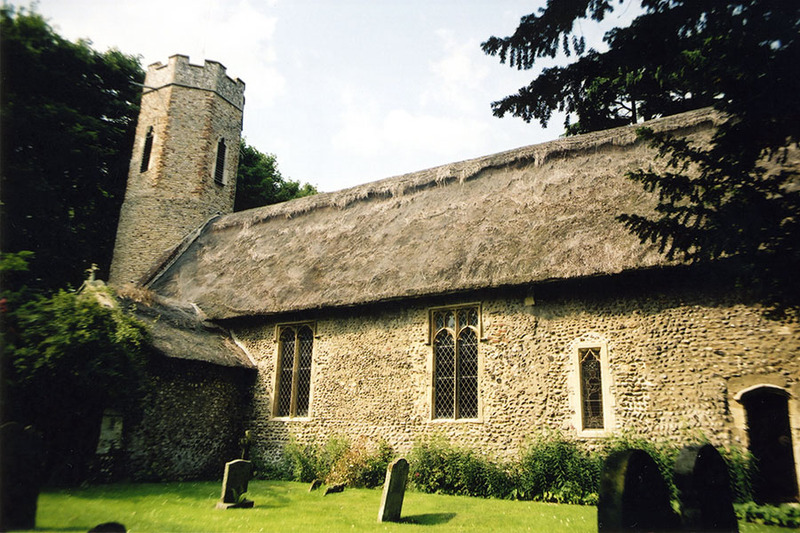 All the thatches are much the same size; around 18 squares or 166.5sq metres of roof. Quite large specimems….. 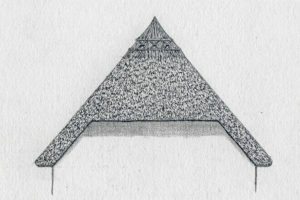 Calculating the area of a roof is arrived at by using some basic geometry. 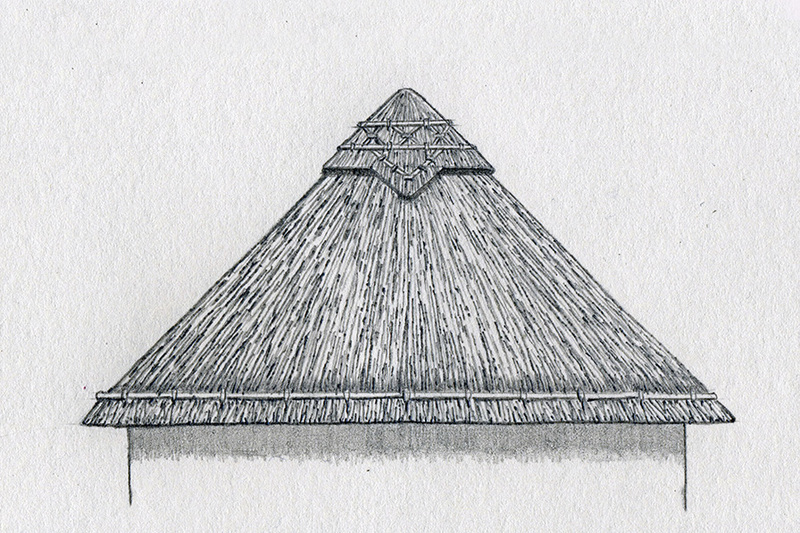 However with thatch the roof’s thickness adds a third dimension and has to be allowed for. 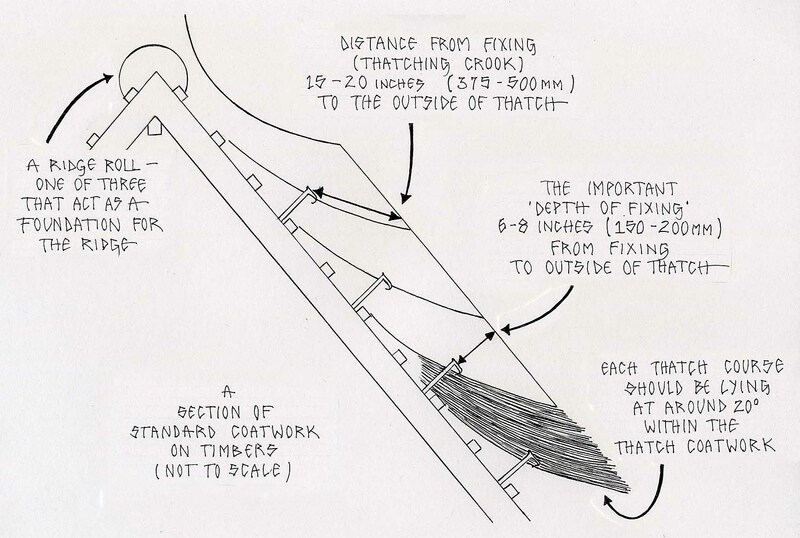 So the thatcher usually measures around any overhanging gables and eaves, into the wall. This generally adds around 60 inches (1.5m), to the length of a building, allowing for two gable ends. And 30 inches (750mm) to the width, of a single elevation, allowing for the eaves. On new buildings or where only a timbered roof exists; 10% is added to the bare timbered area, to allow for the thickness of the new coatwork. 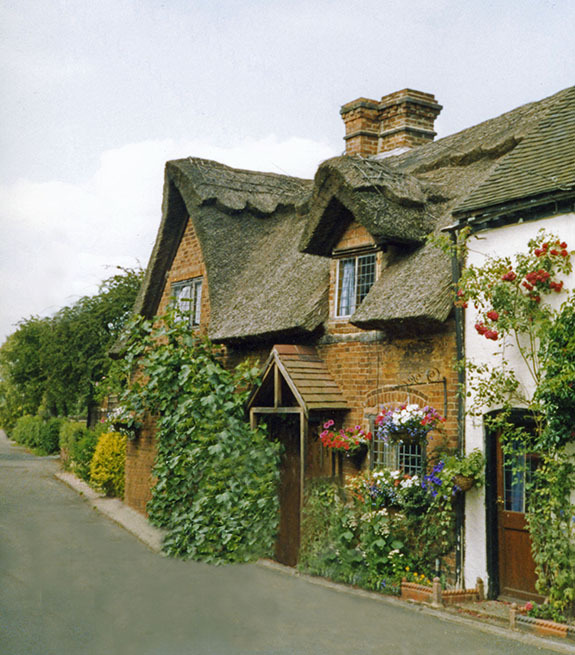 There is no such thing as an average size or price, of a thatched roof. 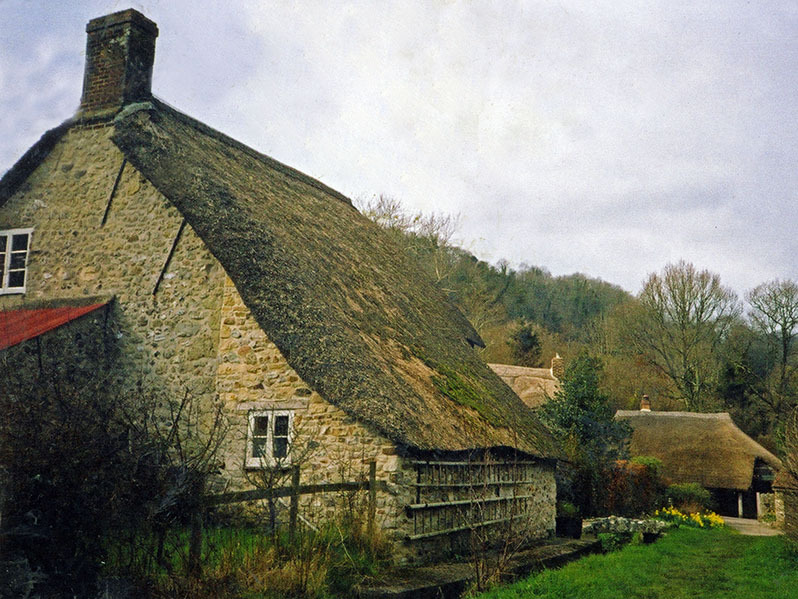 The cost of covering the small cottage, at Shutford in Oxfordshire (above right) would need to be multiplied many times, to allow for thatching the large house, near Bruton in Somerset. Often said to be one of the largest domestic thatched buildings in Britain. Other things have to be considered, in addition to the basic square area and ridge length. Having a roof with what are often called Features; dormer windows, hipped ends and the like, all adds to the cost. These slow down the thatcher and time is money. This is especially true with ridging; the type of ridge required can affect the price considerably; ornamental ridges can be very time consuming. Size isn’t everything … These two attractive buildings have much the same floor area. 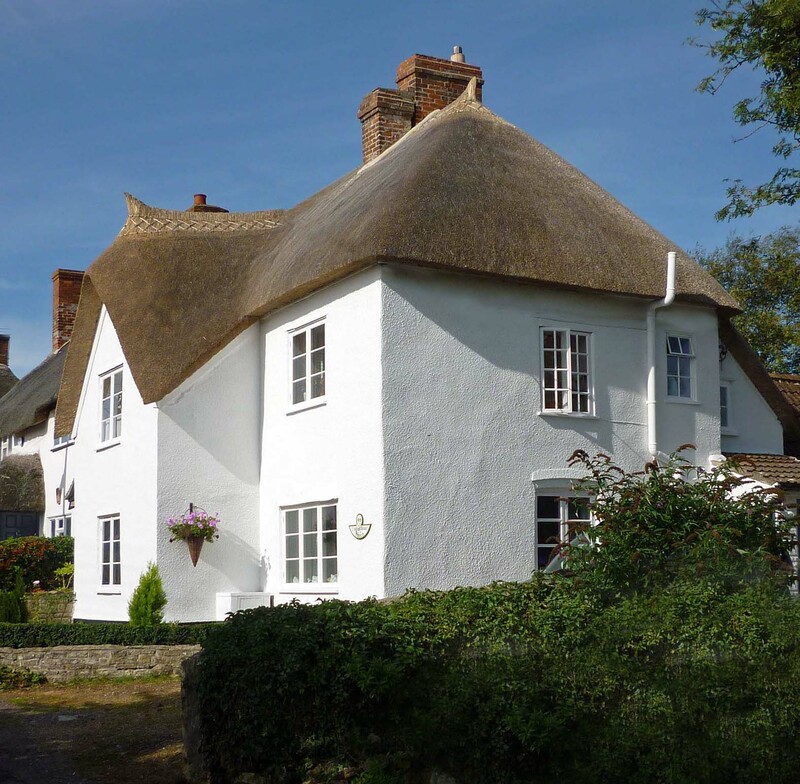 But the simple roof design and ridge, above at Georgeham in Devon is more economic to thatch, than that found on the Staffordshire cottage, at Alrewas. By far the largest part of any thatcher’s bill, is made up of labour costs. The craft is very labour intensive. No one has yet invented a thatching machine, although a lot of thatchers often feel like one! Labour charges can be between sixty and seventy five per cent of the cost of a square of thatching. The percentage is even higher on a purely ridging job. The labour charges themselves are much the same as the other building professions, and vary in a similar way throughout the country. Unless the thatcher grows the materials they use; they have little control over their price. With all thatching products a regular source of good quality material is more important than a few pounds either way; on a tonne of thatch or a load of water reed. Access, for delivery of materials and removal of rubbish, can also affect the cost of a job. Narrow lanes and driveways often mean the thatching materials have to be decanted, into smaller vehicles; or manually carried onto the site. Removing large amounts of old thatch or litter creates the same problem in reverse. The distance to the job from the thatcher’s home is also a factor. Travelling takes both time and money. When all the above factors are taken into account, a price/estimate can then be calculated…..
Long Term costs… As mentioned above, standard thatching consists of the thatch coatwork and the topmost ridge. Where organic materials are used, the ridge never lasts as long as a new coat of thatch; renewing these ridges is the most common maintenance a thatch requires. In fact a great deal of a thatcher’s time is taken up with re-ridging thatched roofs of various ages. Thankfully for the thatchowner, the cost of a new ridge is much much less than the price of a new roof. The cost depending a great deal on what type of ridge is required. This is explained further in the page on maintenance. 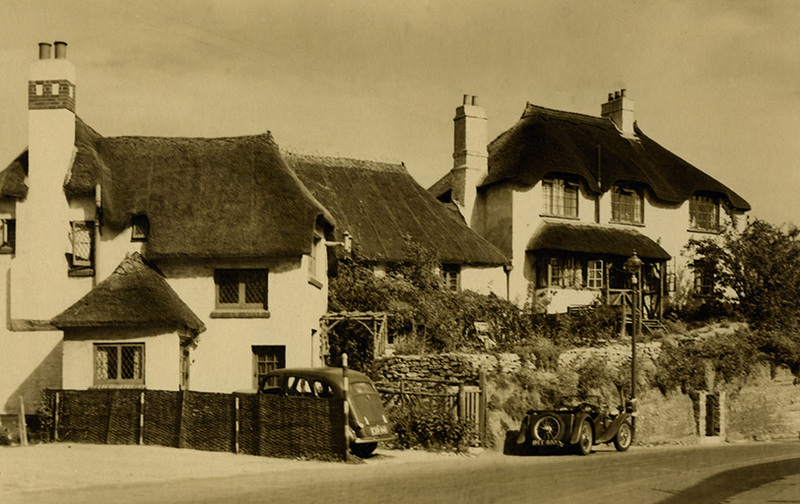 Cars and cottages in the 1930’s… The automobiles outside these attractive seaside cottages at Paignton, in Devon; would have cost their owners much the same as a rethatch. The sporty MG perhaps cost a little more….